The biography for this weeks Illustrated Women in History was submitted by Hayley Jackson. 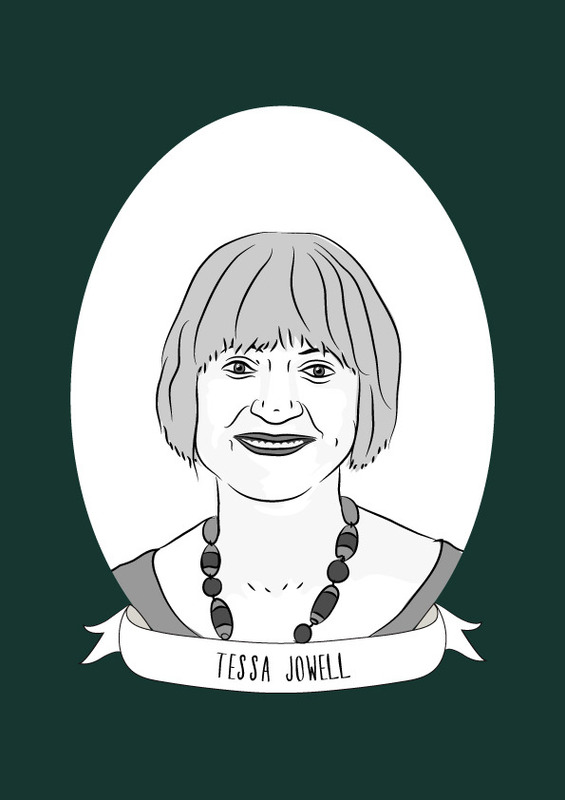 Tessa Jowell was born in London in 1947 and was the eldest of three children. Her father was a physician and her mother a radiographer. The family moved to Aberdeen when Tessa was five. Tessa went to school there and studied at Aberdeen University, then going on to do a MA at the University of Edinburgh. Tessa qualified as a social worker and later trained to be a psychiatric social worker, then becoming the assistant director of mental health charity Mind in 1986. From 1990 until 1992, Tessa worked for the Joseph Rowntree Foundation. Tessa joined the Labour Party in 1969 aged 22. Tessa became interested in politics after watching the Stanley Kubrick film Spartacus “(The film) moved me hugely with its themes of exploitation, courageous revolt and the heroism of the slave uprising”. Tessa’s political career started in local government when she was elected to represent Swiss Cottage on Camden Borough Council in 1971. At the age of 25 Tessa was the Chair of Camden Social Services Committee. Tessa served as a local councillor for 15 years before being elected as MP for Dulwich and West Norwood in 1992. Tessa was pro-European and in favour of a mixed economy but always held a genuine commitment to social justice. Tessa believed that the Labour Party needed to modernise and as such was a fierce supporter of Tony Blair. Tessa was rewarded for her loyalty with being a cabinet member in both Blair and Brown’s cabinets, most notably as the Secretary of State for Culture, Media and Sport between 2001-2007. When Tessa was asked what her proudest accomplishment was as an MP she said it was establishing and setting up Sure Start Children’s Centres: “I moved from Social Care to Government because it’s only in Government that you can provide the big solutions”. Tessa recognised the importance of early years and investing in children’s futures. Tessa will always be remembered for her pivotal role in the London Olympic Games. Tessa came up with the idea of bidding to host the Olympics in 2002 but received little support from her colleagues in the cabinet. Tony Blair recalls her saying “Of course we may not win, but at least we had the courage to try” and Tessa did convince her colleague and ultimately won the bid in 2004 then becoming the Minister for Olympic Games. Tessa stepped down as an MP ahead of the 2015 General Election and received the DBE in 2012 for political and charitable services. Tessa then went on to receive a life peerage in 2015. On Tessa’s 70th birthday, her family made the announcement that she had been diagnosed with a very serious brain cancer called Glioblastoma Multiforme. Tessa courageously spent her last month’s fighting for more treatments to be made available for cancer patients, for knowledge of cancer treatments to be shared more effectively, for speedier diagnosis, greater access to experimental treatments and improved survival rates. In January 2018 Tessa famously received a standing ovation in the House of Lords following her speech on cancer treatments. The speech poignantly showed Tessa’s dignity and bravery fighting for others when she herself was suffering and the video was shared widely on social media by those who felt humbled and inspired. Tessa passed away at her family home on 12th May 2018 with her husband David Mills and children, Jess and Matthew by her side. Following Tessa’s death tributes were led by the Prime Minister and Leader of the Opposition in the House of Commons. Downing Street announced that as a tribute to Tessa, brain cancer research funding would be doubled and the “gold standard” diagnosis testing would be available to all hospitals.